In a recurring feature, the Reader will conduct 15-minute interviews with candidates running for city, county, state, and federal offices that represent Illinois. First up: Fritz Kaegi, a candidate in the Cook County assessor’s race. Former investment analyst Fritz Kaegi is running a largely self-funded campaign for Cook County assessor on a progressive platform against the embattled incumbent, Joseph Berrios. 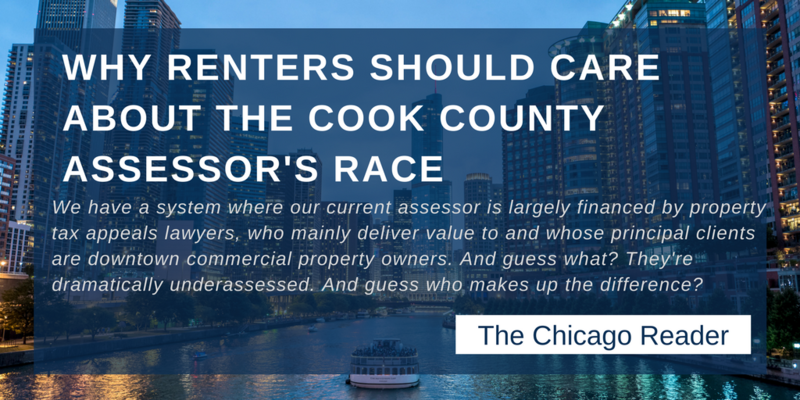 A recent series of investigations by the Chicago Tribune and ProPublica Illinois revealed that under Berrios property tax assessments in Cook County have been grossly unfair, resulting in higher property tax bills for lower-income homeowners and small businesses. Meanwhile, Berrios has received millions in campaign contributions from law firms that represent the wealthiest individuals and businesses seeking to lower their property taxes. While on a break from phone-banking recently, Kaegi—a 46-year-old Hyde Park native who now resides in Oak Park—spoke about how working in finance in Russia fueled his commitment to Chicago, why renters should also care about property taxes, and what he’s learned about power and machine politics while campaigning against Berrios.